It can effectively compress PDF files which contains large images, e.g. scanned paper with high resolution. The compressed PDFs can be easier for web publish, email etc. Click "Downsample" or "Downsample and save as". A-PDF to Image Downsample Command line (pidcmd.exe) is a Windows console utility that downsample the PDF file. The pidcmd.exe is included in the download package already. You can find it at the installation directory, generally, it is located in C:\program files\A-PDF Image Downsample. <input pdf>: Source PDF file. <Downsample Method>: Method of downsample. -S<password>: Password of source PDF file if application. -F<Filter Width and Height>: Filter in downsample. 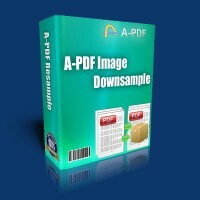 A-PDF Image Downsample is a standalone program costing only $27. It does NOT require Adobe Acrobat Pro, which costs hundreds of dollars.